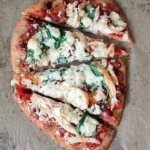 Looking for a delicious homemade whole wheat pizza dough you can make at home? Look no further, this recipe will be your new best friend. I hope your weekend was as relaxing as mine was. We spent the better half of the weekend catching up on chores and packing for our trip to Cabo. I cannot tell you how excited I am. The last time Tony and I went to Mexico was over the 4th of July — it’s our little relaxation spot in the world where we can disconnect when life seems to be moving at the speed of light. Before I jet off today, I wanted to share a recipe that I feel everyone needs in their life: 100% whole wheat pizza dough. 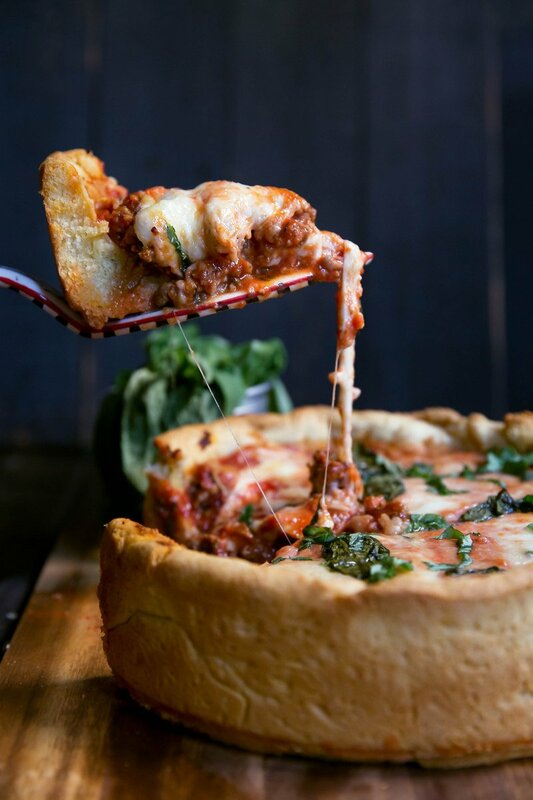 This recipe was actually included in the pizza recipe I posted last week, but I figured it deserved it’s own stand alone recipe so you can come back to it time and time again. 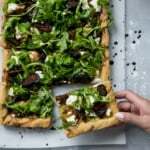 Most of the ‘whole wheat’ pizza dough recipes out there that claim to be whole wheat really aren’t, as you’ll find most of them are made with a mix of whole wheat and regular flour (hello, that’s not whole wheat!). I suppose most of the recipes out there do so because whole wheat flour can be dense and on the drier side. My recipe below is made with a secret ingredient though: whole wheat pastry flour. If you’re a frequent follower of AK, you’ll know that I use this flour quite often because it keeps the final product lighter in texture and less dense than regular whole wheat flour. However whole wheat pastry flour still has all of the benefits of whole wheat flour including fiber and protein, which is why I love it. 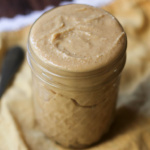 So, if you’re looking for an easy whole wheat pizza dough, look no further! 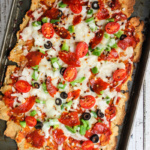 This recipe can be made into a pan pizza, regular pizza or thin crust. It’s perfect however you’d like. Just bake for 5 minutes, add your toppings, then bake for 10-15 minutes more. Question for you: What are your favorite pizza dough toppings?! Mine are jalapeño, onion, green pepper, pineapple and black olives. I know I’m a weirdo but I embrace it. If you make this recipe, tag #ambitiouskitchen on Instagram — or leave a comment below telling me if you liked this! xo. Next place dough in a medium bowl lightly oiled with olive oil. Cover with plastic wrap and a towel and let rise for 1-2 hours or until dough has doubled in size. It’s better if it’s in a slightly warm place. Sometimes I turn on my oven to 180 degrees, then turn it off and place the pizza dough bowl in there with the oven door slightly ajar. This helps create a warm environment. Once the dough has risen you have a couple options: do it pan pizza style or roll it out in a 13 inch circle. To bake in a pan, grease 11x9 or 8x12 inch baking sheet generously with olive oil or nonstick cooking spray. Sprinkle with a little cornmeal. 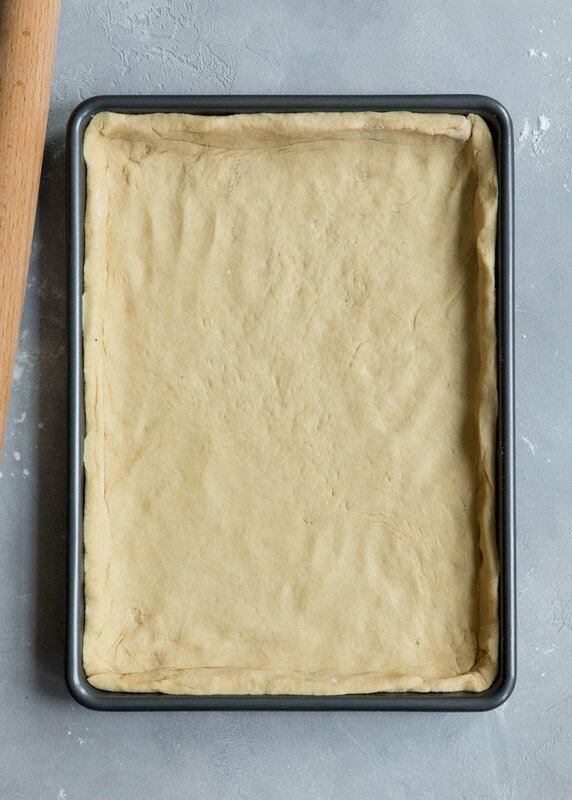 Dump dough onto the oil rimmed baking sheet, and stretch dough out towards the edges. Cover with plastic wrap and let it sit for another 20 minutes. It’s okay if it doesn’t stretch all the way to the edges right way, it just needs a little time to rest. After dough rests, pull again towards the edges of the pan so that it forms a nice small crust. Brush crust with a little olive oil. Bake for 5 minutes, then remove, add toppings and bake again for another 10-15 minutes or until crust is golden brown. 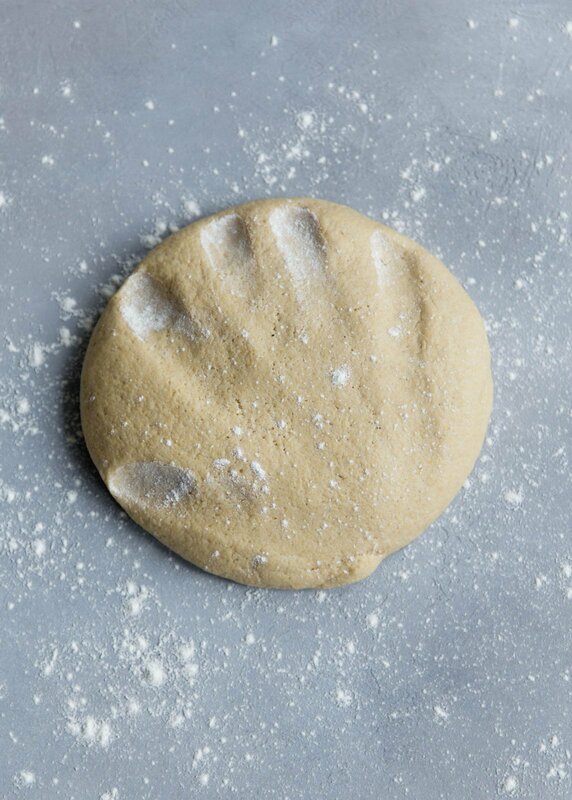 To bake as a circle: roll out dough onto surface dusted with cornmeal. Roll or stretch the dough into a large 13 inch circle. Lift up the edges and fold them over to create a crust. Brush crust with olive oil. Top as desired then bake for 15 minutes or until crust is golden. 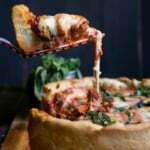 17 Responses to "How to Make 100% Whole Wheat Pizza Dough"
This looks soo gooey good! Thanks for sharing 🙂 I am a lover of whole wheat everything. If I am celiac and want to try making this! Do you think replacing the whole wheat flour with an oat flour could maybe work? Would you have another suggestion? 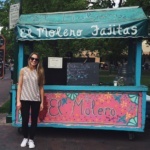 where do you stay in cabo? 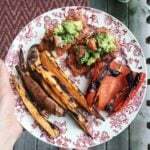 Thank you for sharing this, can’t wait to try it out on my Big Green Egg when I get back home next week, yippee. I love BBQ’d pizza and have been on the look out for a healthier base, thank you. If I don’t have time to bake this right after, can I refrigerate it and bake it later? Love this dough! Very easy to work with!! I made it in my breadmaker and it turned out great. Rolled it out and formed it in my springform pan! Looks delicious. Can you use almond flour if you’re gluten intolerant? I wouldn’t recommend swapping flours in this one. Try this recipe or this one instead! I love what you said about utilizing whole wheat pastry flour. I think that pizza is so amazing and delicious. My friend wants to find a new pizza restaurant in town. I love this recipe! My husband and I LOVE good food too! We lived in Europe with our small children for 7 years. It was a lovely experience (especially for food!) And, due to walking everywhere, we ate whatever we wanted. Well, now that we are back in Ohio with nowhere to walk safely (no sidewalks or public transit), we have had to change our eating habits dramatically. We want to eat well and in a way that is sustainable. So, no fad diets. And, pizza must stay! We have ended up having pizza and movie Fridays with our kids nearly every week. And, this has been our go-to crust recipe for a few months now. Thanks, Monique!